Visiting Paraclete Spirits travel from Lancaster to play in their first Honor Bowl. Coached by storied Head Coach Dean Harrington is no stranger to the festivities of The Honor Bowl and is thrilled to have the opportunity Look for this well balanced team to match up well against Helix Charter, a perennial powerhouse from the San Diego Section. Paraclete is coming off a season where they were CIF State champions and have a strong returning roster as well! 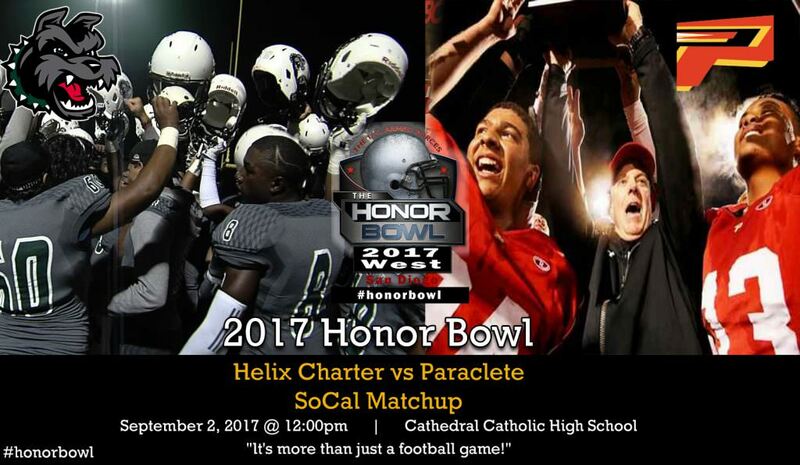 Helix Charter (State #20) is led by second year coach Robbie Owens who expressed a strong interest to play again in the 2017 Honor Bowl The Highlanders look forward to the challenge in noon game on Saturday September 2 at Cathedral Catholic. Coincidentally, Helix lost by a TD vs Cathedral in the CIF SD Section Championships so playing at the Del Mar Heights stadium is not new to the Highlanders. Helix is led by rising senior Carson Baker who passed for 2776 YDs, 23 TDs with only 5 INTs. Owens is pleased with his returned team and looks forward to adding an explosive group of JVs transitioning to Varsity.